Because business is always moving and growing, certain things ‘die’ and become ‘obsolete’. The things that die and become obsolete are considered ‘old’. As they ‘die’, new things start. 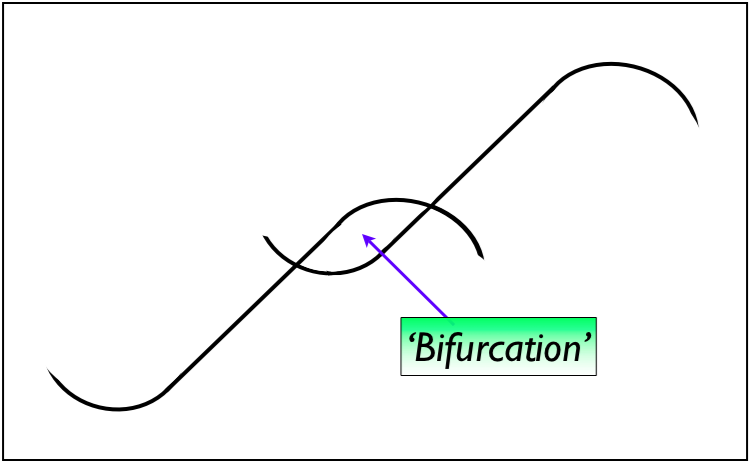 The place where the curves cross over (the old and new intersect) are called ‘bifurcations’. At this cross over, companies often experience confusion, dissent and disagreement as they experience the ‘pain of growth’. 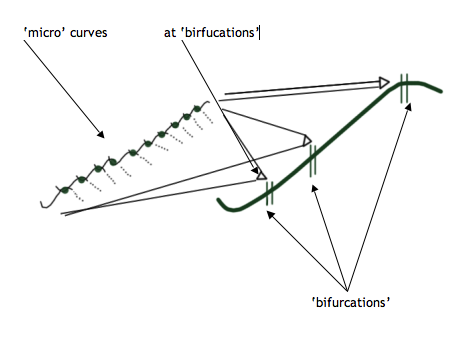 Even though some of a company’s largest opportunities exist at these ‘bifurcations’, they are often overlooked because of the ‘pain’ the company is going through. For many businesses, this feels like the ‘creative destruction’ described by economist Joseph Schumpeter. The Growth Curve can be viewed from a ‘macro’ level (the 30,000 foot view) and from a close-up level. To this point, we’ve shown the macro level. The ‘advanced view’ of the curve looks like the graphics below. Over time, a series of smaller (micro) ‘growth’ curves intersect and die off as the ‘macro’ curve follows its course. At each of the points where the 3 phases occur, a series of smaller change curves are intersecting. This is the ‘micro’ view. The drawing below illustrates the ‘micro’ activity which is the same at each of the transitional phases on the ‘macro’ Growth Curve. The dotted lines show the ‘micro’ curves ‘dying’.